New Jersey ban on self-service gasoline: The madness must stop. 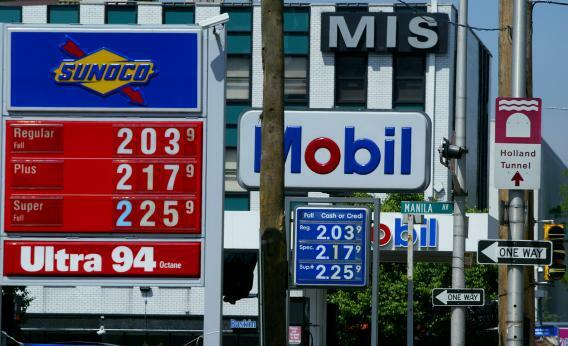 Fun flashback: This is how much gas cost in Jersey City, N.J., on May 20, 2004. Driving up and back to the Mohonk Mountain House for the Slate retreat, my colleague David Weigel had one goal in mind—don’t buy gasoline in New Jersey. And he succeeded. Our northbound refueling took place in New York, and our southbound refueling was in Maryland. Megan Wiegand, driving a separate car was not as lucky, and she needed to stop in New Jersey. Why do people hate stopping in New Jersey for gas? It’s simple. Self-service gasoline is illegal in the Garden State, a policy that Oregon also shares. I don’t drive enough to have strong feelings about this, but many drivers find it so disconcerting to need to interact with another human being while refueling that they deliberately avoid Jersey gas even though it’s cheaper than the gas for sale in New York, Connecticut, Pennsylvania, Delaware, and Maryland. But it’s the source of this cheap gasoline that makes it especially pernicious. Obviously all else being equal, if you ban self-serve gasoline, you’re going to push prices up. New Jersey compensates for this by having an unusually low gasoline tax. That ends up depriving the state government of a source of revenue that scores unusually well on the economic efficiency scale. It’s a consumption tax, which economists generally like. But it also penalizes an environmental externality (burning fuel), and since poor people tend not to own cars, it doesn’t have the regressive implications of a sales tax. Maryland is being smart and raising its gasoline tax to save for the future by investing in transportation infrastructure. New Jersey, meanwhile, is stuck in a dysfunctional equilibrium of underinvesting in its infrastructure, underpricing gasoline, and annoying everyone with an inefficient gasoline delivery system. The idea, presumably, is that this saves jobs. But you could apply that Luddite logic to anything. New Jersey could ban washing machines to create more employment in the maid sector. Yet nobody does that because it would be insane. And it’s not as if “gas station attendant” is such a wonderful job that it makes sense to create an industrial policy strategy around maximizing the number of jobs in that particular field.